Escape tinny tunes and enjoy headphone heaven! The headphone is a simple and obvious idea. If you want to simulate, in the listener's eardum, the effect of a voice, an instrument or a vast orchestra, why bother shifting vast quantities of air in a room when you can simply put the transducer right up close to the ear and move a relatively tiny amount instead? This was what was done in the very earliest days of electronic sound reproduction, simply because the means had not yet been invented to produce sensible sound levels over a wider area. Loudspeakers soon took over for obvious reasons of comfort and companionship, but earpieces and headphones always had their place on grounds of practicality. It's arguable which was the first 'true hi-fi' headphone. Perhaps Beyer's DT48 model in 1937 qualifies, but in commercial terms the first Koss 'Stereophone' made more of an impact, in the mid-1960s, as the first headphone to capitalise on the advent of stereo. Sennheiser got into the game shortly after with the HD414, an open-back model which, with its highly distinctive yellow foam earpads, achieved the sort of world dominance (particularly in radio – look at practically any old colour photo of a DJ in action!) that most manufacturers only dream about, for the best part of two decades. But simple though the task of the headphone appears to be, there have been substantial developments over the years and some highly divergent approaches to designing them. Before getting into the details of specific products, let's have a look at why this is. First and foremost, a headphone should not have a flat frequency response. This sounds like a bizarre statement, but is literally true and is, in fact, a result of how the human ear works – or, if you like, how sound works in the context of the human ear. Loudspeakers aim to recreate the sounds of instruments and voices at a distance from the listener which is of the same order of magnitude as that of the original sound source. That certainly does require a flat frequency response, or something close, but the way a headphone generates sound, only a few centimetres from the eardrum, means that some frequencies end up getting considerably accentuated. In order to approximate the ear's response to 'free field' sound (normal everyday sounds), headphones should have a tailored response. 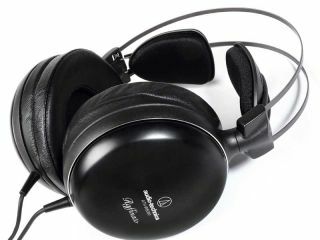 If we put it like that, it might seem that the ideal would be to make headphones with a flat acoustic output and equalise electronically, but that's never caught on and would really require a custom equalisation for each headphone – ideally for each listener – which rather defeats the 'plug in and go' convenience factor of headphones. Instead, manufacturers have to be cunning with the mechanical details of their products to give them a response which sounds acceptable. That said, there is plenty of tonal variation between headphones, even high quality models, which you will notice in seconds when comparing models. Luckily, we are very forgiving when it comes to tonal accuracy. There are limits to what we can deal with, but a slightly uneven frequency response is something we get used to very quickly. Other aspects of headphones are very personal, including the extent to which they exclude ambient sounds. Some people find it very unsettling to have room noise cut out, others love the seclusion. Obviously, no two headphone wearers will find the comfort factor exactly the same with a given model and then, of course, there are the usual hi-fi imponderables of each individual's taste in music and listening level. For all these reasons and more, there is plenty of scope for variation between headphones.